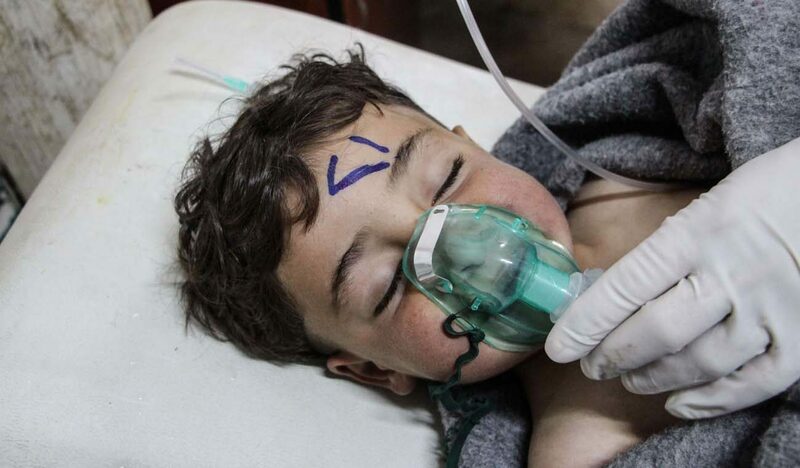 UPDATED – VATICAN CITY (CNS) — Pope Francis strongly condemned a shocking chemical attack in Syria that left some 70 people, including at least 10 children, dead. “We are horrified by the latest events in Syria. I strongly deplore the unacceptable massacre that took place yesterday in the Idlib province, where dozens of civilians, including many children, were killed,” the pope said April 5 before concluding his weekly general audience in St. Peter’s Square. Images of dead men, women and children lying on the streets provoked international outrage following the attack April 4 in a rebel-held area. Western leaders have accused Syrian President Bashar Assad and the country’s military of perpetrating the attack, based on reports that warplanes dropped chemical bombs in the early morning. Pope Francis encouraged those helping with relief efforts in Idlib province, and he appealed to world leaders to put an end to the violence. “I appeal to the conscience of those who have political responsibility at the local and international level, so that this tragedy may come to an end and relief may come to that beloved population who for too long have been devastated by war,” the pope said. The attack occurred the same day representatives from more than 70 countries were gathering in Brussels for an April 4-5 conference on resolving the humanitarian crisis in Syria and to discuss ways to support a peaceful resolution to the conflict. Archbishop Paul Gallagher, Vatican secretary for relations with states, was among the representatives and addressed the conference April 5. “The Holy See invites all parties to the Syrian conflict to spare no effort to end the seemingly endless cycle of violence, to restore that sense of solidarity that is the basis of social cohesion and peaceful coexistence,” Archbishop Gallagher said. The pope also said his thoughts and prayers were with the victims of the bombing of a metro station in St. Petersburg, Russia, that killed 14 people and left 50 wounded. Chaos erupted April 3 when a bomb was detonated in a subway train. Police said the bomber was Akbarzhon Dzhalilov, a Russian citizen born in Kyrgyzstan. Following the attack, security forces said a second bomb was found at a nearby station, but it had failed to explode. “As I entrust to God’s mercy those who have tragically died, I express my spiritual closeness to their families and to all who suffer because of this tragic event,” Pope Francis said. The statement was issued by the USCCB’s president and vice president, Cardinal Daniel N. DiNardo of Galveston-Houston and Archbishop Jose H. Gomez of Los Angeles. They said they would pray that God will help those who suffer and bring them consolation.